"BANGKOK, Thailand — In the mascaraed eyes of Thai teenyboppers, South Korea is ground zero of hip. More than Lady Gaga, more than any local act, Bangkok kids aspire to the saccharine perfection of Korean pop. Thai authorities, however, have proven less welcoming of the “K-Pop” phenomenon. With each new Korean fashion craze comes official warnings that the new fad may blind, disfigure or even kill. The Seoul-born craze for “Big Eye” contacts can cause blindness and, if swapped among friends, AIDS, according to Thailand’s health ministry. Officials warn that prickly glue-on eyelashes, popular among Korean divas, can put your eye out. Yet another public service announcement warns against imitating Korean looks through surgery or toxic whitening creams. The latest advisory blames trendy black hosiery — another fashion import fromSeoul — for a summer rash of dengue fever in women aged 10 to 24. The mosquitoes are drawn to the leggings’ dark hues, said Deputy Health Minister Pansiri Kulanartsiri. All of these trends are lumped under what sociologists call the “Korean Wave.” (The press has called it “Kim Chic.”) Roughly 10 years ago, the South Korean government began subsidizing the export of slick soap operas and pop groups for pan-Asian consumption. The investment paid off. Teens across Asia are now addicted to Korean pop culture: soaps, boy bands and films. The wave has steadily grown in China, Japan and all of Southeast Asia, where drab state-controlled media often struggle to compete. 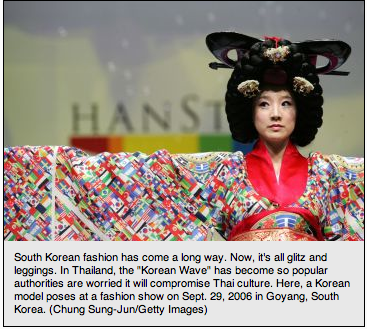 Korea has essentially provided a template for modern Asian glamour. Its stars are glossy lipped and porcelain smooth. K-Pop singers are assembled into boy or girl groups in which airbrushed aesthetics are arguably more important than their synthesized music. The genre’s calling card is flawless, surgically perfect cuteness. What the Bangkok press calls “Korean Fever” exploded in Thailand around 2006. Since then, Korean soap operas have aired in Thailand roughly 100 minutes per day, according to the Korea-Thailand Communication Center. In the last 10 years, the craze has more than doubled the number of Thai visitors to Korea to nearly 200,000. Some Thai authorities, however, have cast Korean Fever as an overtly sexual, superficial threat to Thai culture. K-Pop has even sparked a Korean language craze, compelling high school and college kids to study with professional tutors in their spare time. The K-Pop wave drew in Nora during a split with her boyfriend roughly four years ago. Amidst her heartache, she grew obsessed with Korean break-up songs and struggled to decipher the lyrics. Her Korea fascination grew so strong that she briefly relocated to Seoul to become fluent. Nora has since returned to Bangkok and her Korean Fever has gone into remission. For years, pundits across Asia have predicted a premature crash to the Korean Wave, said Doobo Shim, a media communications professor at Seoul’s Sungshin Women’s University. That crash has yet to come, even in the face of a small nationalist backlash to Korean pop culture in Japan and a larger push back in China. Chinese groups have accused the Korean Wave of stealing Chinese actors’ jobs. Following a ticket giveaway misunderstanding by Korean pop ensemble Super Junior in Shanghai, Chinese hackers vowed revenge and launched viral attacks on the group’s Web site. Korean sociologists are now actively monitoring a potential Korean backlash throughout Asia. But in Thailand, an ancient trading crossroads and cultural sponge, concerns over Korean Fever seem isolated to conservatives and health officials mystified by K-Pop fashion fads. Polls by The Korea-Thailand Communication Center suggest that Korea’s image has markedly improved in Thailand in the last five years. The craze has mostly succeeded in baffling Thai parents. “Before the Korean wave,” she said, “we just dressed like kids from the states.”"